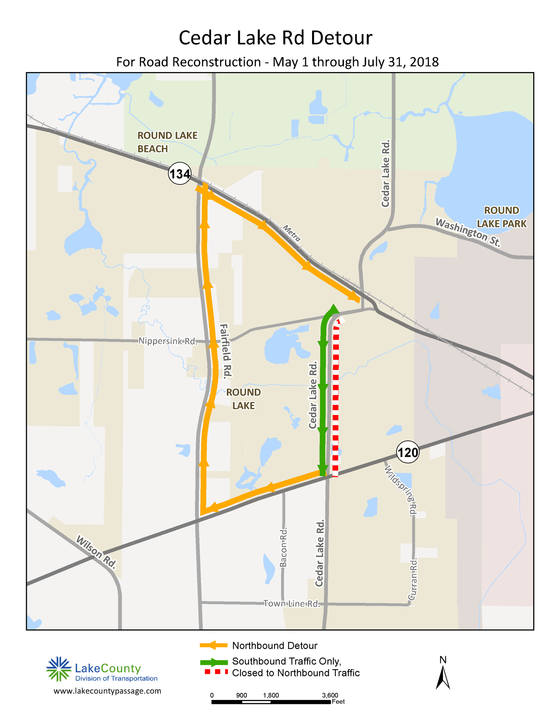 Round Lake, IL - The Lake County Division of Transportation (LCDOT) is reconstructing and widening Cedar Lake Road from IL 120 to Nippersink Road. As part of this project, LCDOT will be closing northbound Cedar Lake Road starting Tuesday, May 1 at 7 a.m. Northbound traffic will follow a posted detour route, and southbound traffic will continue to use Cedar Lake Rd during construction. The northbound Cedar Lake Road detour will remain in place through the end of July. For more information please visit the project website. Detour Route: IL 120 to Fairfield Road to IL 134.